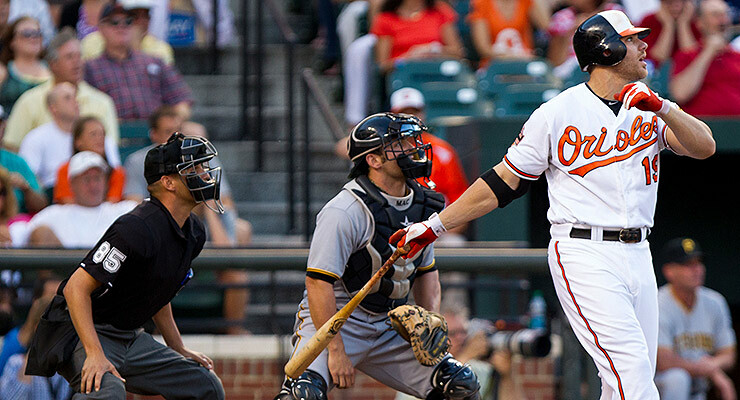 Chris Davis knows the success one can have when you hit the ball in the air (via Keith Allison). Hitting the ball on the ground creates something of a dichotomy for hitters and coaches. Some demand it, trying to put pressure on the defense by forcing more fielders to handle the ball on each play. A ball in the air can be caught for an out, but a ball on the ground requires a catch, a throw, and another catch to retire the batter. Others would like to hit everything in the air because there is only so much damage that can be done by a ground ball. With these conflicting beliefs, it may be difficult to understand what approach is truly best for all hitters, or each individual hitter. Confusing things further, both of these camps often will talk about using the same swing to get opposite results. You can swing down to hit the ball on the ground, or you can swing down to produce backspin and hit it in the air. It seems irrefutably silly that both of these philosophies are alive and well in the baseball world, at all levels (including the highest levels, by my sources). Not only is this a paradox, but it is also the wrong kind of swing altogether. Swinging down greatly reduces the chances of squaring a ball up when the timing of the swing is not perfect, which is something we’ll look at later. First, let’s focus on balls after they have left the bat. At the amateur level, fielders and field conditions are not as excellent as in the major leagues. Fewer ground balls are converted into outs due to reduced range, more errors, and bad hops. Additionally, power is a smaller part of the game in high school and college since players are not as physically developed. There are fewer players able to drive the ball consistently to the outfield and over the fence. Given this, it seems more reasonable to try to hit the ball on the ground at these levels. However, I would not advocate it for professional hitters, or those aspiring to be. The data I am presenting tell a different story. Let’s start with some numbers. If a major league hitter wanted to gear his swing toward one type of batted ball, which one should he pick? As most of us probably expected, line drives are the most desirable result. Fly balls have a large slugging percentage but the lowest likelihood of leading to a hitter reaching base. Ground balls own the lowest weighted on-base average of the three, and it’s not really close. Based on these simple stats, hitters should be trying to hit hard line drives to have the most success with a lean toward fly balls if they mis-hit a pitch. The 19 point advantage in on-base percentage does not make up for the 385 points in slugging percentage between ground balls and fly balls. It should be noted that reaching on an error is much more likely on a ground ball than it is on a line drive or fly ball. Let’s assume that all reached on errors are from ground balls, and the full credit belongs to the hitter’s ability to get on base this way. The best reached-on-error rate last year was by Andrew McCutchen at 48 ROE/PA (reaches on error per plate appearance). If we crudely add that into the league average numbers, it equates to approximately 21 points in OBP, still nowhere near overcoming the enormous difference in production due to the extra-base potential of a fly ball. Again, this may play a bigger part in amateur baseball, but major league teams are pretty good at getting outs when you give them a ground ball. This seems obvious from a majors-wide viewpoint, which is why so many pitchers try to force ground balls, and some get paid primarily for their ability to do just that. For another point in favor of hitting fly balls, I refer back to Tango and Lichtman’s analysis in The Book of groundball pitcher vs. flyball hitter matchups. Flyball hitters have a distinct advantage over groundball hitters against groundball pitchers. As more teams focus on stacking staffs with groundball pitchers, the importance of hitting the ball in the air becomes more important. To me, this has to do with swing path, which I will further explore later in this article. Remember the numbers above are just for league average. What about for players who rely on their speed to produce offense? Perhaps they see a greater benefit to hitting the ball on the ground because they put more pressure on the infield defense to get the ball to first base. To explore this possibility, I looked at all of the qualifying hitters from the 2013 season and graded their speed using FanGraphs’ version of Bill James’ Speed Score. In the absence of reliable raw speed measurements, this gives a decent enough approximation of players’ absolute speed without too much added noise coming from baserunning intelligence. Though not a perfect correlation, the expected advantage of fast hitters versus slow hitters on ground balls is present. How about just the fastest 25 hitters? How do they do on all batted ball types? There is a much bigger difference in on-base percentage now between ground balls and fly balls, but the weighted on-base average rankings have not changed. Fast players still do better hitting the ball in the air than they do on the ground. Faster players also get a slight wOBA bump on line drives, likely by being able to take more doubles and triples than the average hitter. Let’s look at the batted-ball data from another perspective. How about power-handicapped players? If a hitter has a low likelihood of hitting the ball out of the ballpark, perhaps he would be better served trying to keep the ball on the ground. Here are the same numbers for the 25 worst home run hitters in terms of homers per fly ball this past season. The rates of HR/FB range from 1.50 percent to 6.80 percent. Awesome! The best HR/FB rate in this group belongs to Alexei Ramirez, at 3.60 percent. As a group, they have a 27-point advantage for ground balls over fly balls. So, if a hitter expects to hit fewer than about four percent of his fly balls out of the park, he should probably give up and hit the ball on the ground, right? Not exactly. The better the home run-per-fly ball rate, the greater advantage in flyball wOBA over the groundball variety (obviously). 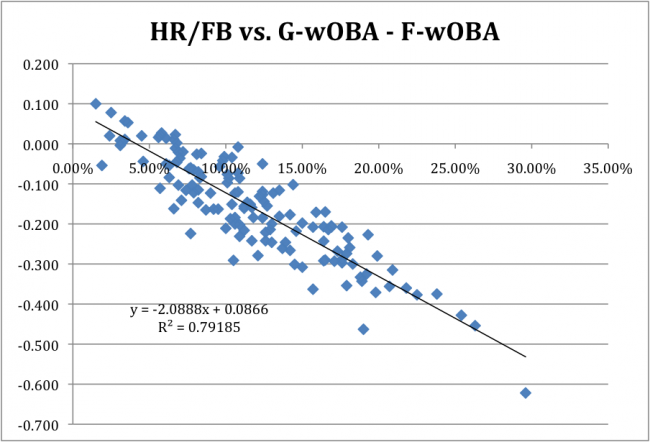 You can see the small group above the x-axis where ground balls result in a higher wOBA that we already explored, all of whom had below-average HR/FB rates. The x-intercept of the linear regression line falls in at 4.15 percent, giving an estimate for the breakeven point in this sample. You may have noticed the decreasing line drive wOBA in the last two tables as the power numbers have gone down. Most of this effect is likely because line drives hit by weak players are not as hard to defend as those hit by strong players. I also suspect that a hitter who sells out for ground balls will not hit line drives as often, or be able to achieve the same results from those line drives due to quality of contact. I attempted to find further statistical proof of this, but this is probably where the sample of hitters limits the analysis. Even the most groundball-heavy regulars must hit the ball well enough and often enough to warrant their consistent playing time. Now for the swing itself. First, some logic, then we will look at a few examples of how hitters create these results. To consistently hit the ball flush, hitters need to swing on a slight upward path to match the ball on the same plane. Even line drives must be hit at a higher angle than level to the ground. Nothing really earth-shattering, since other research points to this already happening naturally. This is the same reasoning that likely explains why flyball hitters do better against groundball pitchers than groundball hitters do. A groundball pitcher tends to throw pitches with more negative vertical movement. The correlation between pitcher groundball percentage and average vertical movement on fastballs (PITCHf/x data) is slight but appreciable (R-squared = .14). Flyball hitters tend to swing on a sharper uphill plane, matching the steeper downhill plane of groundball pitchers. This results in more true contact and driving through the ball on the same level, producing more hard line drives and well-hit fly balls. So what does this look like? For a demonstration, let’s take a look at the leader in line-drive percentage among the 140 qualifying hitters from 2013, James Loney. Here he is hitting a double on a belt-high pitch into right-center field. The swing starts with Loney’s back elbow dropping under his hands and toward the pitcher. The hands drop in on top of the elbow before leveling off through the contact zone, until after extension when the hands roll over. Because the shoulders tilt slightly, the barrel is working underneath the hands by the time it starts to pass his back hip. This brings the swing path on a slight uphill plane, generating natural loft without relying on backspin to make the ball carry. Here we see some moves similar to the swing above. The back elbow drops down below the hands, even more than Loney’s did. The hands work down on level with the elbow near the back hip before coming through the zone on an uphill plane. His shoulders are tilted toward the plate like Loney’s, perhaps more so, and his spine is much more angled back toward the catcher rather than relatively straight up. This positioning results in a very steep uppercut swing as he drives through the pitch. Even though some hitting coaches would refer to this as dropping the back shoulder, leading to too much length and uppercut, notice how tight the barrel stays to his body as his hands and elbow drop into plane. This keeps his swing short to the ball despite being in an uphill position with his upper body. Because he is so strong, he can gear virtually his entire body toward hitting the ball in the air and have tremendous success doing so. The first move is similar to the previous two swings, though the hands and elbow go together more. The hands push in front of the elbow earlier than the other two, taking some whip out but likely lending more control to his swing. The hands come through level or on a slight upward plane, dropping under his shoulders before driving forward. His shoulders also tilt toward the plate, bringing the barrel of the bat underneath the hands. On approach to contact, the bat is swinging on a slight upward plane that matches the line of the pitch. Even for a guy who should not be trying to hit a fly ball, he still swings up through the pitch, just not to the same degree as a guy like Chris Davis. 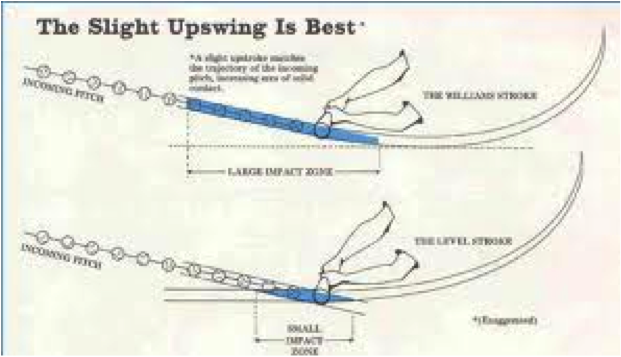 A quick note about the “swing down to create backspin and lift” sentiment: stop that. It is okay for guys to think in terms like this to keep from getting long with the swing, but please realize that this does not optimize batted-ball distance in reality. Swinging down on the ball while the ball is also going down will more often result in hitting the ball down or missing it, unless one possesses unbelievable hand-eye coordination. For a typical fastball, the batter should undercut the ball by 2.65 cm and swing upward at an angle 0.1594 rad. I do not believe this is common practice or knowledge in major league baseball, which is unfortunate. I have heard a lot of second-hand horror stories about the philosophies of many organizations in the game. Especially at the big league level, there is little evidence that a true groundball swing will lead to success. Line drives are the key to hitting, regardless of hitter attributes. 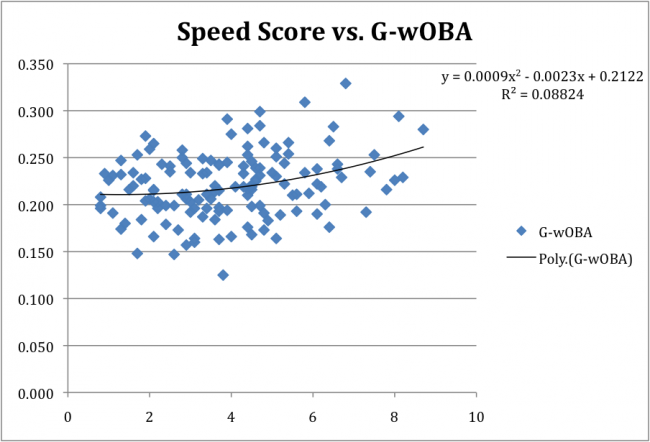 Speed appears to have less of an impact on a hitter than what popular belief says. While speed may help boost a player’s batting average on balls in play, fast hitters do not have an automatic incentive to hit the ball on the ground, based on these results. They can turn doubles into triples rather than just outs into singles. That said, there is some (but little) wiggle room for individualized approaches to swing path. To tell Chris Davis and Marco Scutaro to have the same swing would be ridiculous. There are data here that show hitters who are not strong enough to hit home runs consistently may benefit from hitting more ground balls than fly balls. Again though, line drives are still best for even the least physical hitters. A slight uphill path to the ball should be the goal of every batter in order to maximize efficient contact and batted-ball success, with even more uppercut swings reserved for those who can drive the ball out of the park. Every hitter is different and has different strengths, but the wiggle room lies more in how high in the air each hitter should aim. Dan is Fangraphs Lead Prospect Analyst, living in New York City. He played baseball for four years at Franklin & Marshall College before attending medical school. Follow him on Facebook and Twitter @DWFarnsworth. Great article. One of the best I have read on hitting. I definitely don’t agree with everyone in Ted Williams’ book, especially since he didn’t actually do half the things he talks about (short stride, stay on the toes, etc.). I think just the idea of swing plane is enough to make it a good read. I saw that story on Chris O’Leary’s site; pretty cool stuff. Pretty amazing how little most of pro baseball actually understands about player development. Too much politics in my opinion. A thousand years ago we were taught to swing at the pitcher’s hand at the top of release, not unlike the idea of trying to hit the pitcher in the head with the batted ball. Try to get square on the ball and hit it to center. If you’re a little under it’s off the wall, a little over it’s a screaming one hopper, a little early or late it’s in a gap. Very good piece, good to see some serious thought. American, but Ted Williams was still playing, Mickey Mantle had won a Triple Crown, and the men who taught me knew Tom Greenwade and Mickey Owens, among others. It was a good time to be a kid. Great job Dan! Hope all is going well in LA. Very nice piece. Thanks Jerry. I’ll email you sometime in the next week with some of the stuff I’ve been looking at. While I admit Pujols has more of a flat bat path than some others, he is still more up than down in his swing path as it approaches the ball. The bat has to come down to get on plane with the ball, but it is not going down when making contact. Thanks for pointing him out though. He is certainly one that does flirt with the line. False. Look at Pujols’ swing here. Power hitters don’t swing down on the ball. Im not sure what pic of pujols you have been looking at but he does not chop wood. total rotates to ball good bat lag dropping barrel in path of ball very early good hitters bucket maintained then big bang occurs. look at video no chopping down on ball bat moving up on to contact. Williams was certainly the better hitter on the field, but Charley Lau wrote the best book about hitting. “The Art of Hitting .300” is a masterpiece. Flyball hitters probably strikeout a lot more. They may be hitting the ball harder/farther when they make contact, that’s if they make contact at all. I don’t think writers will be voting for Mark Reynolds/Carlos Pena over Derek Jeter/Ichiro Suzuki for HOF because they hit the ball farther. This study validates Whitey Herzog’s advice to powerless but speedy Ozzie Smith to try to hit ground balls. I think he gave him a little bonus for each ground out and little fine for every fly ball (but presumably not for line drive hits). and it just occurs to me that I forgot to lead with, “excellent, informative, well-written piece.” Thanks very much for the article. I’m glad you enjoyed it. Thanks for the feedback! Fly ball hitters sometimes have the tendency to have extremely low BABIP’s. That’s not a good thing at all. They’ll have longer slumps and lower batting averages because they can’t get lucky. Luck is good thing. BABIP is the same as OBP in this study. Ground balls also have a low batting average in play, even in the speedy hitter group, and a much lower wOBA than on fly balls. I’m convinced that happens everywhere; it does in Pennsylvania, Maryland and Southern California at least, by my knowledge. Even pro teams talk about the same thing. As for Williams, I’ve heard a rumor that Joe Cronin wrote Ted’s book, with only minimal input from Ted himself. That would definitely corroborate what you say about revealing only a small part of his knowledge. One thing left out: Bunting, which I assume is classed as a GB. The small selection of really fast guys without power who do well would, I assume, include guys who occasionally bunt for a hit (as they are now trying to teach speedster Billy Hamilton). If they do it with some frequency they may pull the infield in enough to also improve their OBP on regular ground balls. Note there is no real bat path for a bunt, so they could easily use the correct upswing angle when swinging away. Just checked into it; bunts are actually compiled in a separate category from ground balls. Good thoughts though. I’m going to tell you exactly why Big league hitters do swing down. They have a slight downward path at the start of the swing not to hit ground balls it’s because they don’t want the barrel of the bat to flatten out to early. Believe me I played profesional baseball for 8 years.